You may be surprised to hear that the benefits of having straight teeth outweigh a confident smile and personality. According to the American Dental Association, straightening your teeth can actually have an impact on your oral health. Teeth that are widely spaced or crowded can lead to red, swollen gums, which indicates periodontal disease. If you are considering braces, but don’t want to deal with the pain or the way they look, Invisalign could be for you. You have probably heard of Invisalign, but you may be wondering how it works or if it is right for you or your child. Invisalign has many benefits over braces and is more aesthetically pleasing than regular metal braces. 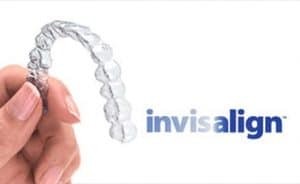 Invisalign straightens teeth using a series of custom-made plastic trays created especially for the patient, The aligner trays are made of durable, invisible plastic that are worn over the teeth. Wearing the trays gently shifts the teeth into place based on the exact pattern your dentist at Dental365 plans for you. Simply change your tray every two weeks until treatment is complete. One of the many benefits of Invisalign over braces is that the patient doesn’t have to struggle to floss between braces. Simply remove the Invisalign tray and brush and floss normally. Eating is also simpler with Invisalign. Instead of having food restrictions and having to worry about breaking wires and brackets, the Invisalign tray is removed while eating. Invisalign is also a better option for those playing contact sports. If you would like to learn more about Invisalign, contact a Dental365 office near you to schedule a consultation. Dental365 has convenient evening and weekend appointments to make squeezing dental care into your schedule a breeze.